One of the friends I’ve made through the blogosphere is Lisa from notes from a mad housewife. She and I met through comments on each others’ blogs, and then we began connecting elsewhere, as you do. We share similar tastes in patterns and fabric. We exchange recipes. I think of her and chuckle anytime I hear someone say combination of hard and soft. I am regularly motivated by her creations and tutorials, and lately she’s had me crushing hard on chambray. So I already knew that I was being inspired by her when I bought this fabric, but I didn’t realize quite how much until I started adding it all up. 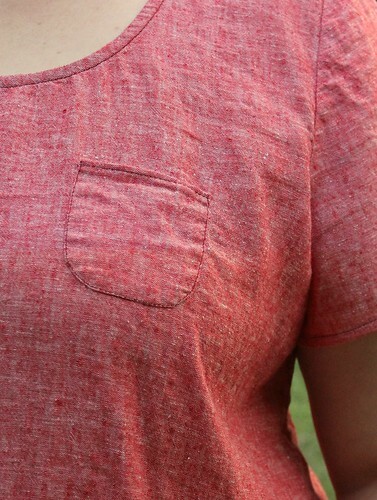 The only changes I made from my basic Scout pattern were to 1) add the Tiny Pocket, and 2) lengthen the sleeves by 1″. Just to see how I liked it. (I love the pocket, but I think I like the shorter sleeves slightly better.) I also used contrasting topstitching ’cause I lu-HUV contrast topstitching. * This is another story for another time, but I’ve gone so long between Scouts because I. Lost. My. Tweaked. Pattern. Had to recreate it, which was harder than it should have been. More on that later. Both styles look great and I definitely need to take your advice and find some good uses for my smaller yardage! Yes, I definitely machine washed and dried both of these tops, but I also did so before making them to take care of the shrinkage. And yes, this chambray was a wrinkler! Ironing a must. I’m incredibly happy to have found your blog! My creative juices are flowing again…thanks for the push. Those are both LOVELY! Great work, sis! These are two great tops! 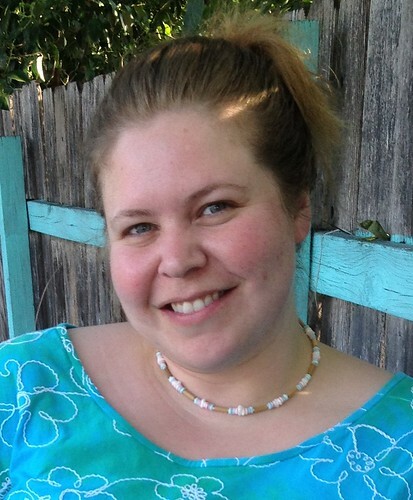 I love the contrast of the solid and print in the Butterick top. My daughter and I just went through your Flickr pics to find more of Elphie. She’s sooo cute. We have a Corgi with ears that are very similar. I realized looking through your pics that I have the same IKEA fabric waiting to be made into a Hummingbird skirt. I may have to borrow your idea of an exposed zip. These are both lovely tops! That chambray is great! Fabulous job using up all of it! 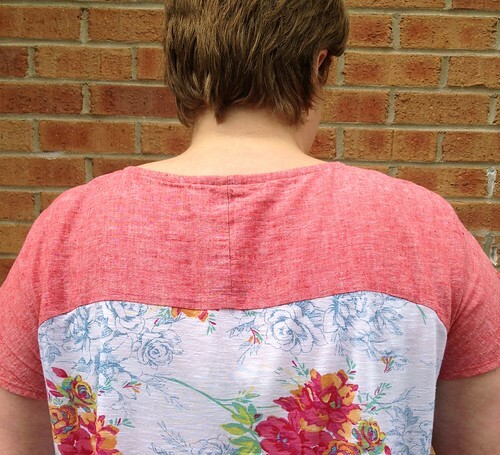 It’s such a clever and pretty way to use up that lovely fabric. And you got 2 pretty tops to wear! Love it! HA! 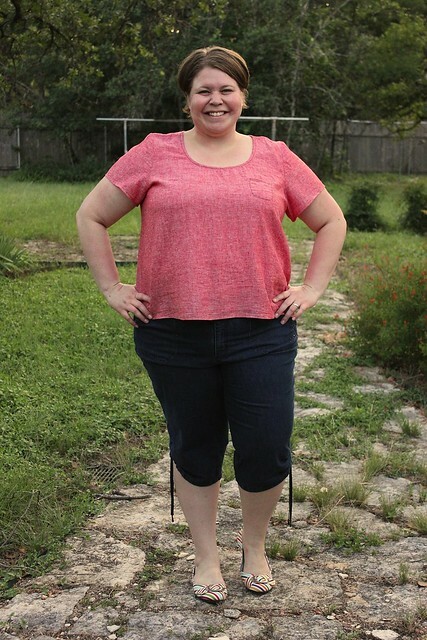 Yes, although I didn’t hate that bias chambray as much as you did… ;) Thanks, Evie! I’m “selectively frugal” too – in the exact same ways, LOL! And I too am constantly inspired by Lisa! And I think “What Would the Mad HouseWife Do?” (wwtmhd?) totally needs to be a thing. Oh, yes the shoes! A birthday present from Miss Lulu, aren’t they fab?? WWTMHD…officially now a thing! ;D Thanks Gail! You definitely made the most of that yardage! I just keep saving my small pieces and scraps with hopes that I will find something to do with them! Great fabric and tops Susan. You have done a spectacular job squeezing out that second top. Excellent. 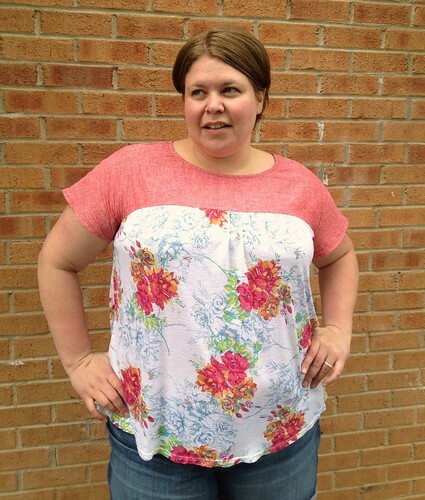 I like both the tops, especially the floral print fabric! 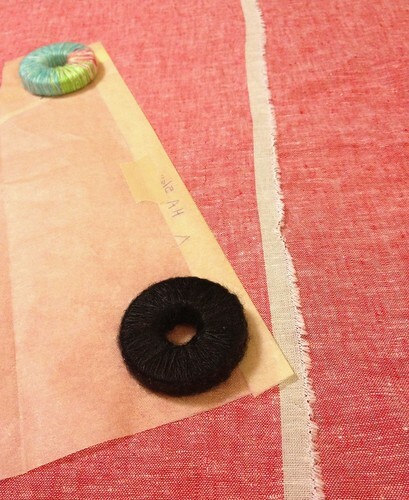 If I am running out of fabric I use the selvage as the seam allowance too. I find it hard to relinquish scraps too. I always think but this would be great for doll clothes… when I don’t know any girls young enough to make them for.. oops! Ginger from the Hummingbird sew a long here. You know, it’s hit and miss! I have a friend who regularly finds silk charmeuse in the value section but that’s never happened to me… :) Nice to see you, Ginger! CUte as can be!! The scout is really nice with the tiny pocket and I love the second top with the cool florals. Wow! Impressive pattern cutting skills there. I’m so bad about cutting frugally (does that make sense?). Pretty darn inspiring. Thanks Mela! Totally makes sense… I’m trying to do a little better but it doesn’t come naturally to me, either! for a moment you had me worried, i have slow internet so as it was loading i saw only the title, and i thought you were actually angry – but on the contraire, you’re happy as usual! WHEW! :) lovely lovely scout! I love that you conserve fabrics by manipulating the cutting layout. It is something I’ve never even thought about! Love both your tops..But the one made from left over fabrics is my favorite. So cute..Looks so good on you.Happy sewing. Thank you Judy :) I have to say that one has gotten a *lot* more wear because it requires little-to-no ironing! Both look very nice, they fit you well! This cloth doesn’t stretch, does he? is it comfortable enough around the chest and shoulders?